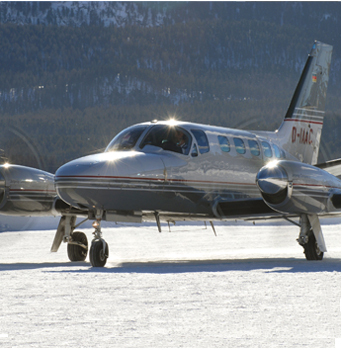 The Conquest II is a fast, high-performance and comfortable turboprop aircraft. Its outstanding spectrum of performance combines a high cruising speed with a low approach speed. Comfortable leather armchairs arranged in conference style invite you to work effectively or to relax with a glass of champagne from the well-assorted on-board bar. The Conquest II allows you to reach airfields that are “near your doorstep” but cannot be approached by jets.